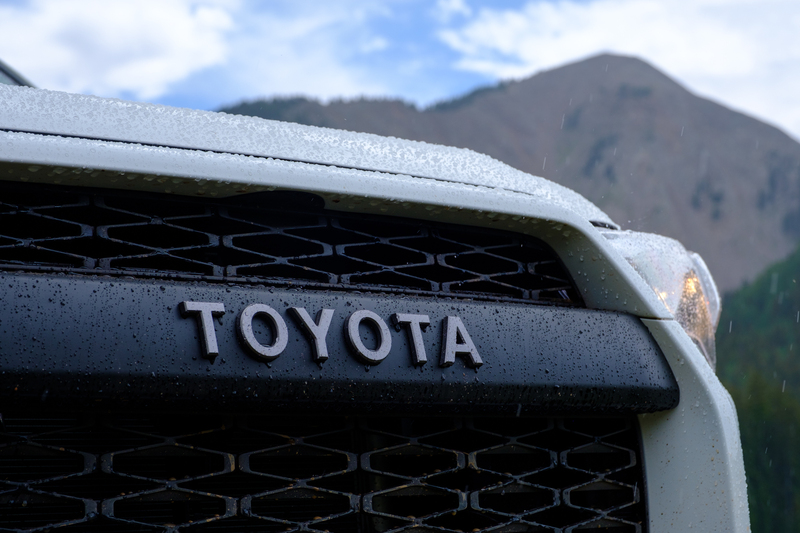 Few names garner as much respect in the overland world as Toyota. The brand’s quality, capability, and reliability have made it legendary among travelers and enthusiasts alike, but during the last two years, American auto manufacturers have been turning up the heat on this Japanese giant. Trucks like the ZR2 are coming equipped with better off-pavement features, more horsepower, and a lower price point than the Tacoma. The Ford Raptor and Ram Power Wagon are serious competition for the aging Tundra, and the Jeep JL Rubicon is now almost as comfortable, and certainly more capable than the 4Runner. Throw in the new Bronco and Defender that will soon be unveiled, and the 4Runner’s popularity starts to look shaky. 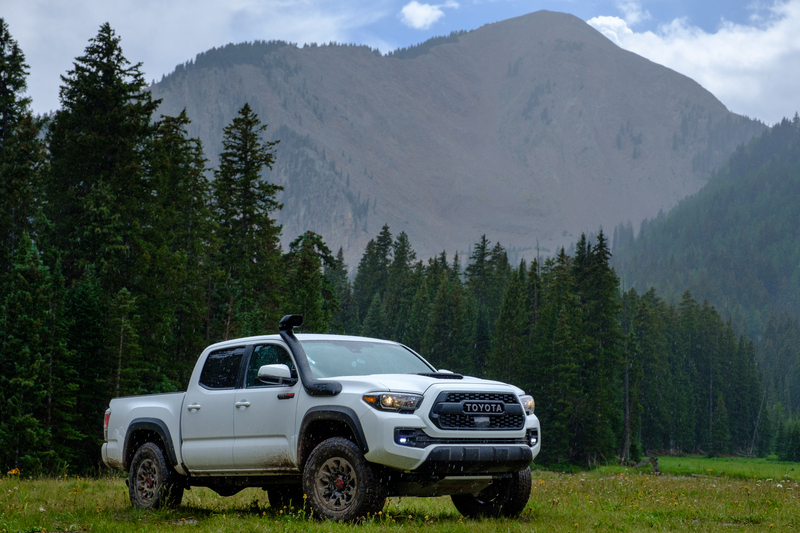 With these threats closing in, it was clear that the 2019 TRD Pro line would need to be something special. The only question was, could Toyota pull it off? 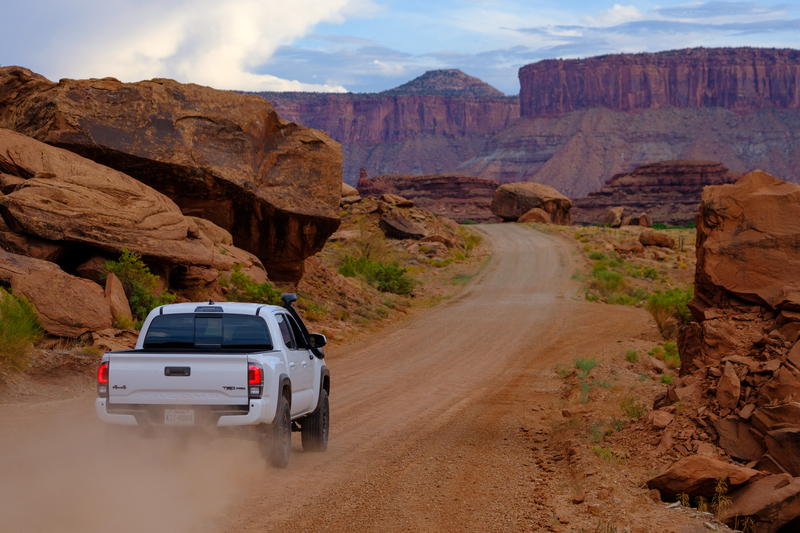 We headed off to the mountains and deserts of the US Southwest to find out. Let me start by saying that in itself, this press launch was a testament to Toyota’s re-engagement with its audience. They could have just stuck us in a fancy hotel somewhere and attempted to wine and dine us into a good review like most manufacturers, but instead, we were dropped off in the heart of four-wheel drive country with Expedition Overland, and set loose for three days of camping and off-roading. That alone is unheard of, but the fact that Toyota employees were actually on the trip driving with us and talking around the fire was phenomenal. 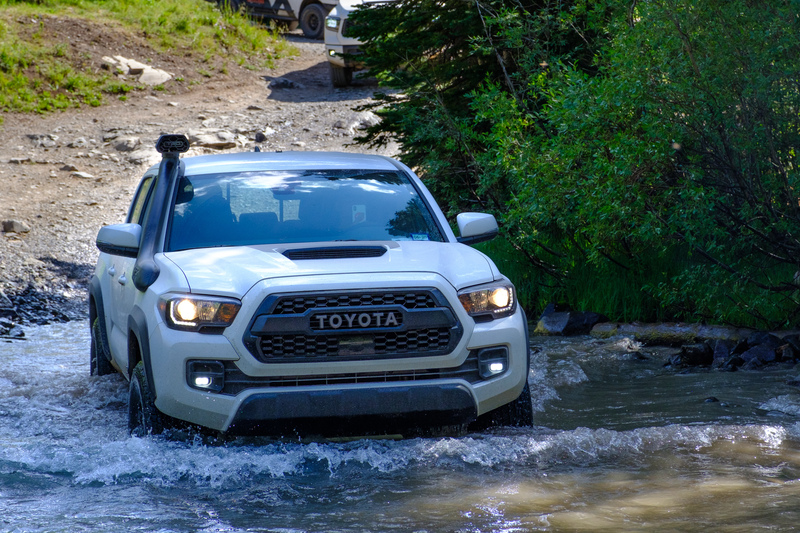 In my opinion, it’s proof that Toyota has remembered that cars are supposed to be more than practical; they’re supposed to be fun, and the 2019 TRD Pros are certainly that. Each has been upgraded with an array of both cosmetic and functional accessories, which together made them a pleasure to look at and drive. Of course, none of them are perfect, so let’s dive into what we liked, and what we didn’t. 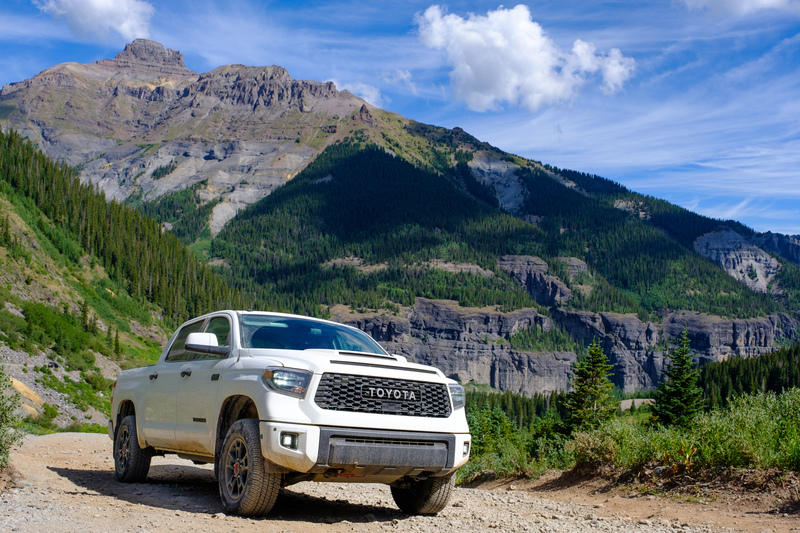 At first glance, the 2019 model isn’t significantly different from the previous generation Tundra, but as you look closer, you’ll begin to notice the changes. 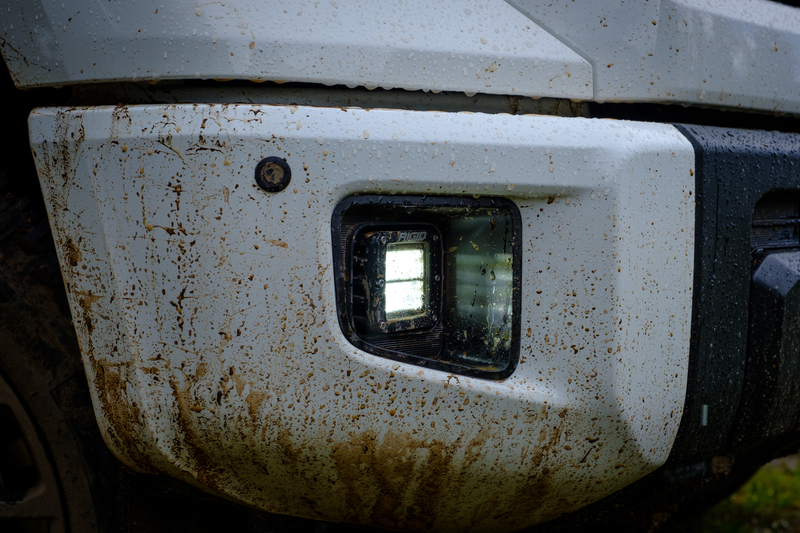 It now sports Rigid LED fog lights in the bumper, along with LED headlights and daytime running lights. 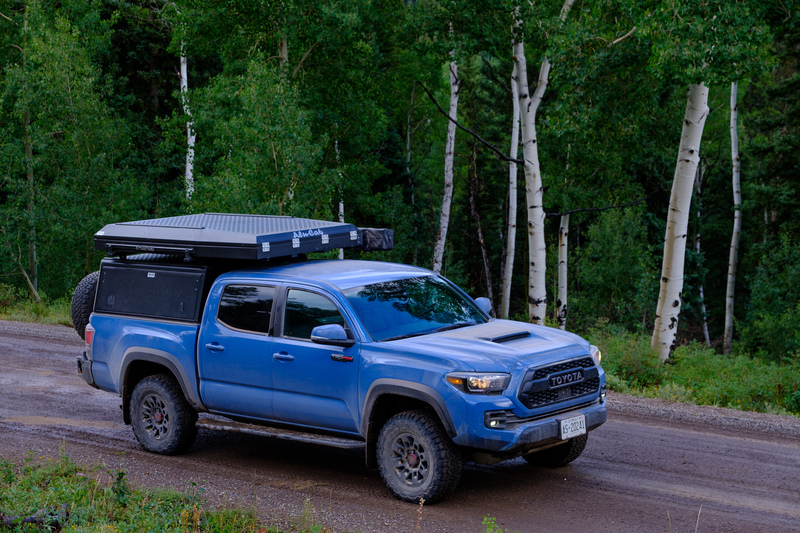 An updated hood scoop sits atop an aggressive hood with an updated grill, a 1/4-inch-thick front skid plate protects vital components from damage on the trail, and all new 18-inch BBS forged aluminum TRD wheels wrapped in Michelin 275/65R18 A/T Tires sit underneath. The real news though is the 2.5-inch Fox performance shocks and TRD tuned springs. 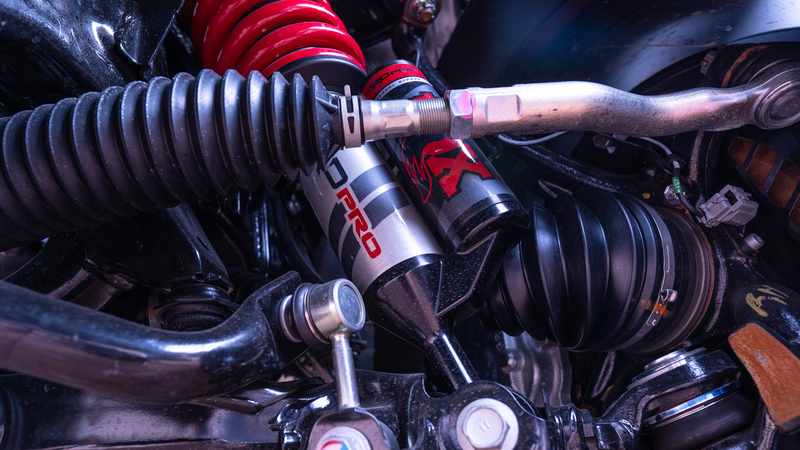 These internal bypass shocks were specifically tuned for each vehicle by the engineers at TRD and adapted to take on a range of terrains in safety and comfort. The front struts are your standard aluminum monotubes, but they lift the front end 2 inches to nearly level. The rear struts feature a piggyback reservoir for additional oil to aid in damping performance under extreme use or while hauling heavy loads. 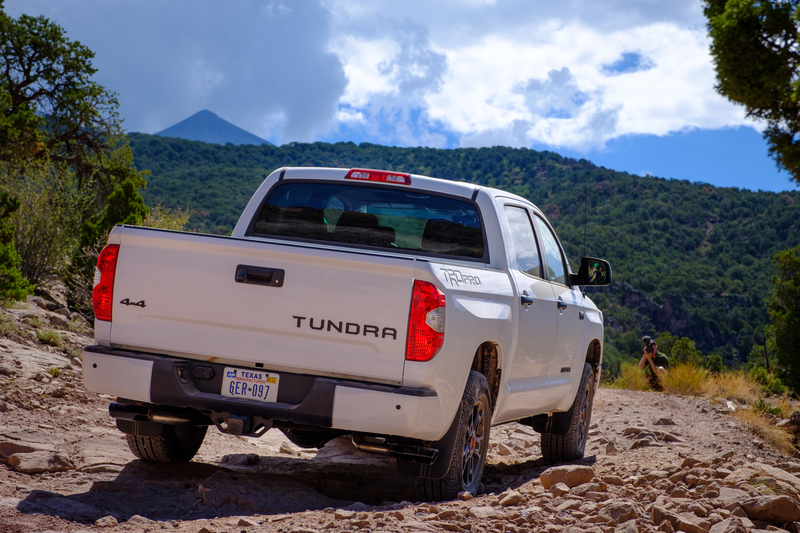 Like the rest of the Tundras, the TRD Pros are built in Toyota’s San Antonio plant, and that makes sense because this feels like a Texas-style truck. For starters, it’s big. The cab is as wide as an Amarillo sky, with plenty of headroom and loads of space for cargo and passengers. 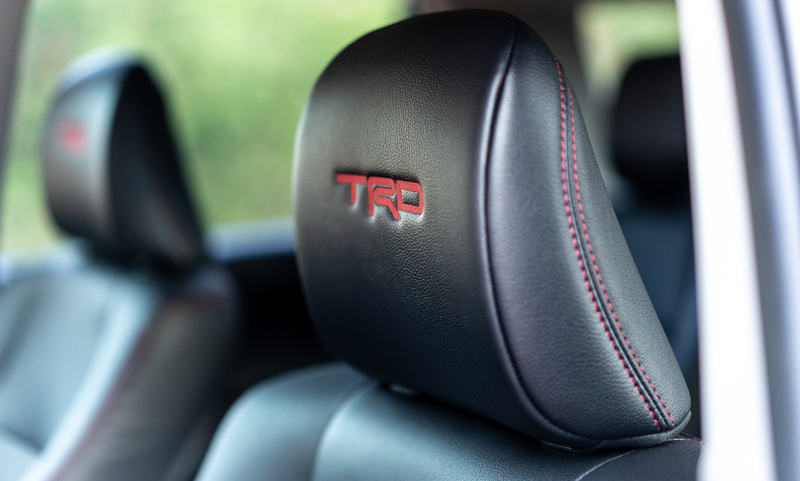 The TRD emblazoned leather seats are each roughly the size of the Panhandle, and in my opinion, were the most comfortable of the three vehicles. The steering wheel, on the other hand, was my least favorite. 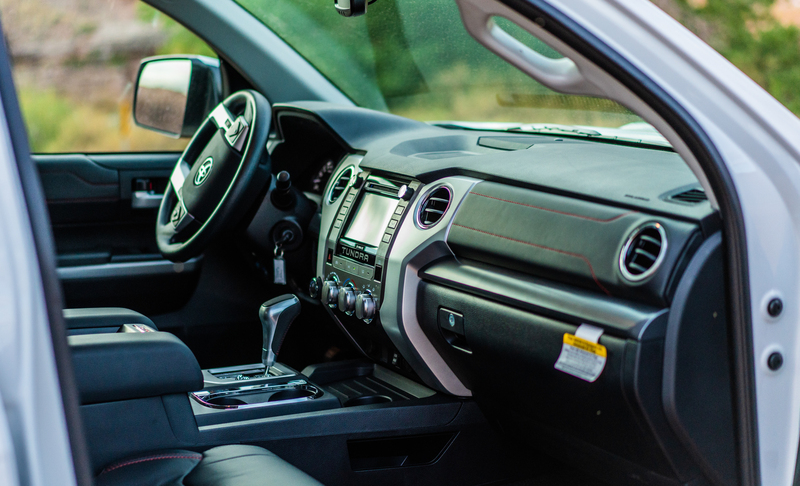 The injection molded plastic felt cheap and dated, especially after time in the 4Runner and Tacoma with their sculpted, leather-stitched wheels. The body is large as well and comes in just a hair under 80 inches wide, and 229 inches long, which for reference is larger than a Ford Excursion. That makes overgrown trails a bit of a squeeze, a problem which we encountered early on in the trip. 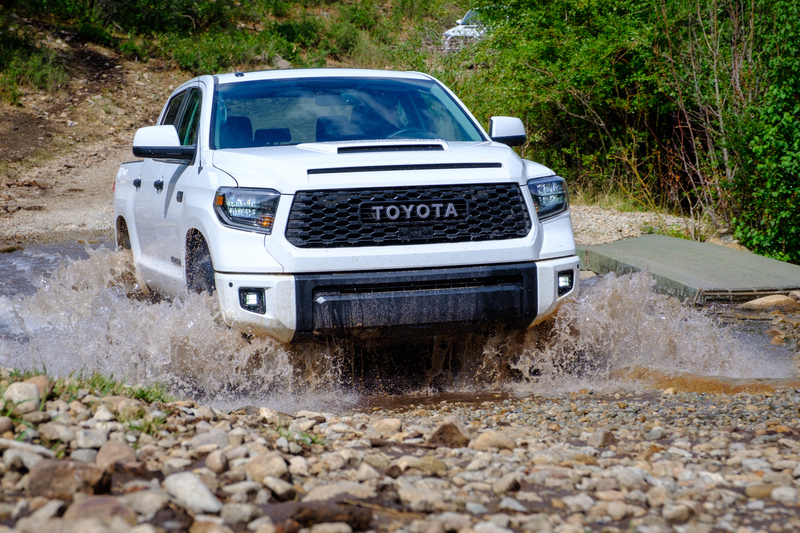 Fortunately, this large body is matched by an equally large motor, a 5.7L V8 producing 381 horsepower, 401 pound-feet of torque, and one hell of a throaty sound from the twin TRD exhaust pipes in the rear. Sadly, the sound those exhaust pipes make while grinding over rocks is less appealing, and we heard it several times throughout the trip. 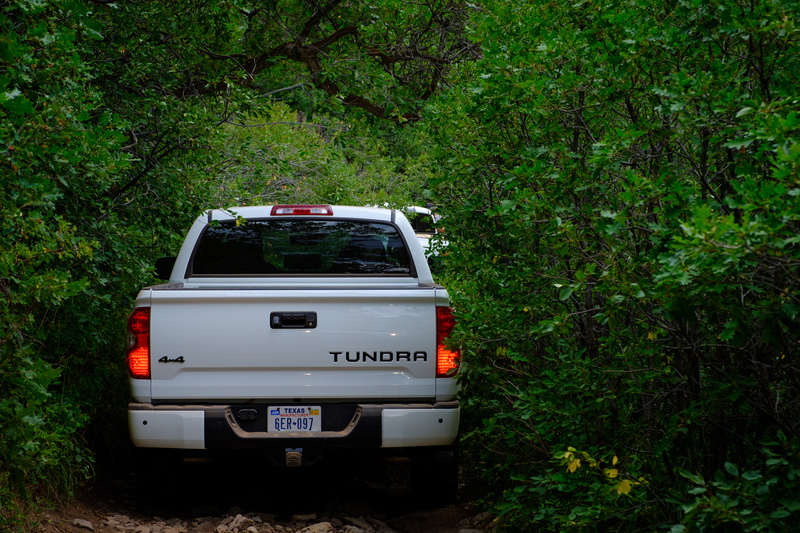 Despite its size and low-hanging exhaust, the Tundra was graceful on the trail and able to navigate every obstacle we threw at it. 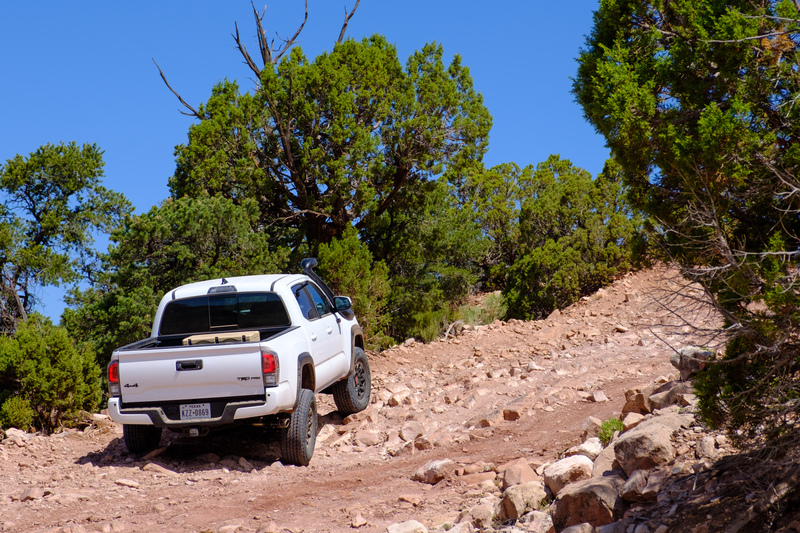 The Fox suspension rode like a dream over embedded rock, corrugations, and loose stone, and the steering was smooth, though not as responsive as the smaller Tacoma. 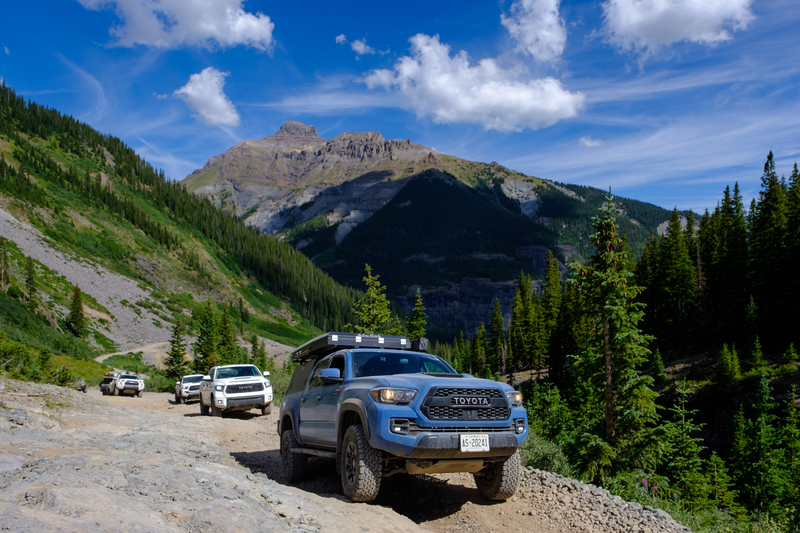 I loved the instant power and torque of the V8, as well as the larger payload capacity of the full-size platform, but I couldn’t help but feel it missed out on Toyota’s off-road party. 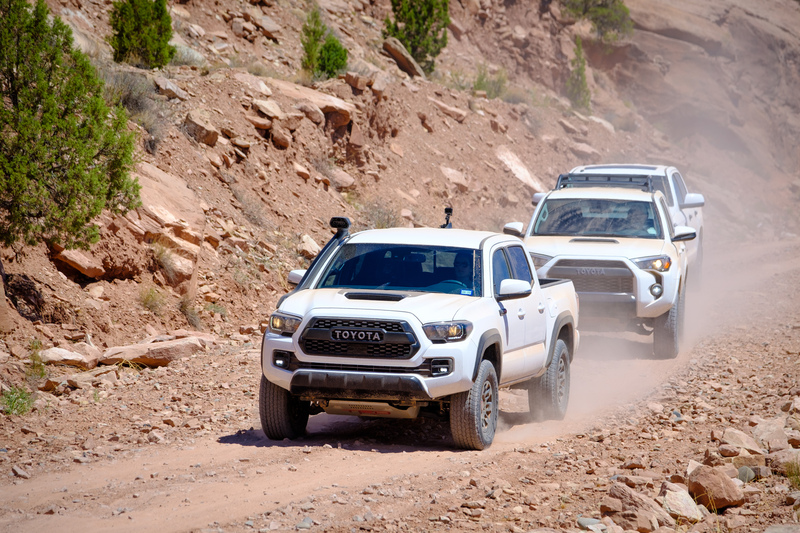 Both the Tacoma and 4Runner TRD Pros pack rear locking differentials, crawl control, aggressive tires, and multi-terrain select, whereas the Tundra has, well, none of those. With the popularity of the full-size segment growing every day, I feel like the Tundra would be exceptional if equipped with these options, but as it stands, it’s just good. Hopefully, that will change with the next generation, which is sure to come soon. The 4Runner’s popularity has exploded over the past few years, and it’s easy to understand why. 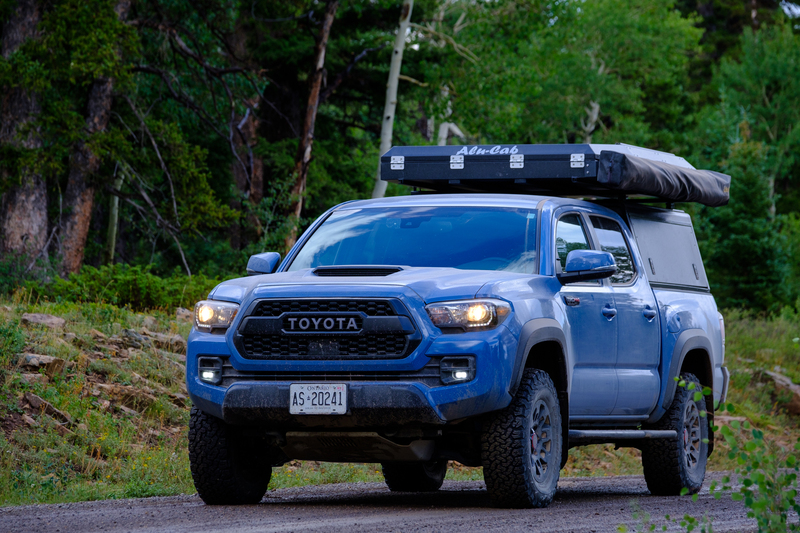 It offers a body-on-frame construction, good suspension and trail capability, along with sufficient cargo capacity for your typical overland trip. Not wanting to ruin a good thing, Toyota set out to make simple improvements to the attributes we already love about the 4runner. They started with the suspension, upgrading to a 2.5-inch Fox shock as used on the other TRD Pro platforms. The fronts are paired with TRD-tuned springs which lift the nose 1 inch over stock, and the rear ride is at standard height with a 2-inch piggyback reservoir for additional cooling capacity. 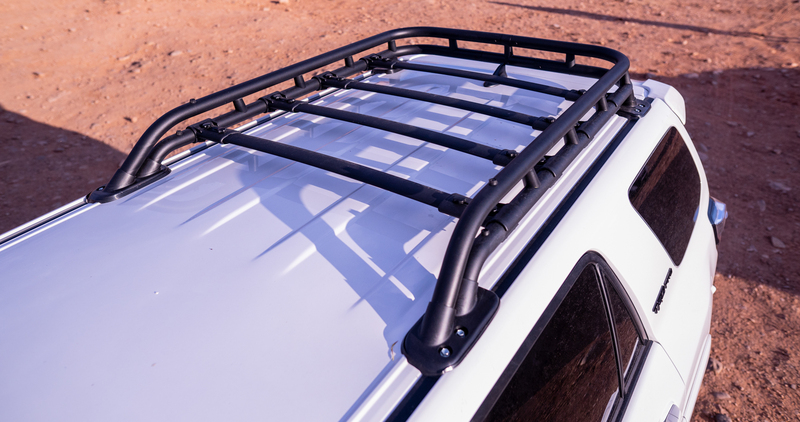 Up top, you’ll find an all-new TRD Pro roof rack that not only looks great but provides additional capacity for all types of cargo. Wood, dirty gear, and possibly even a rooftop tent would be ideal for the new rack. 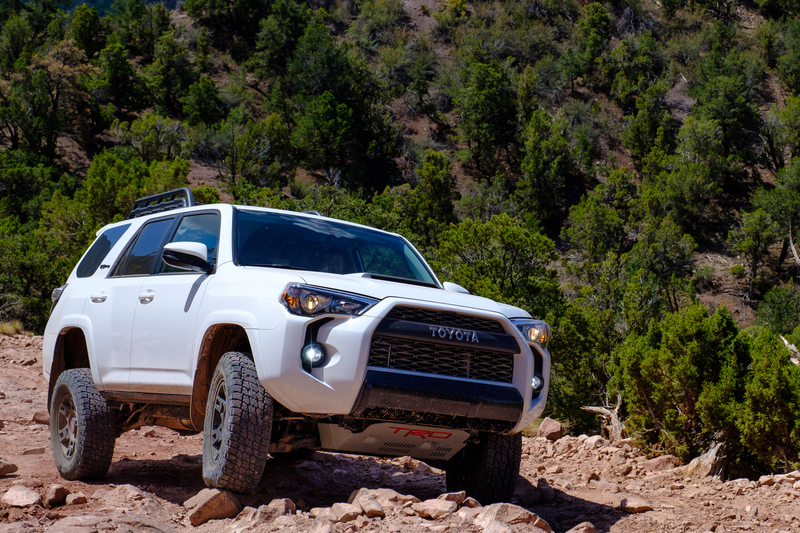 Like the other TRD Pros, the 4Runner packs an embossed TRD skid plate for 2019, which it displays clearly thanks to an aggressive approach angle. A new Entune Premium JBL audio system with Integrated Navigation and App Suite is also included, along with a host of other interior goodies like a TRD shift-knob and TRD stitched seats. A few of you may remember that I purchased a 5th Gen 4Runner back in 2014. It was a Trail Edition and the best off-road package offered at the time, but it was lacking out of the box. I quickly swapped the mild tires for something more aggressive, upgraded the suspension to raise the front end, and then added a roof rack for additional storage. When I saw that the TRD Pro was packing a factory equivalent to this setup, I was eager to see how it stacked up. The first thing I noticed was that the ride characteristics blew those of my 4Runner’s Old Man Emu suspension out of the water. Both the compression and rebound cycles on large bumps felt more controlled, with a smooth return to a neutral position and no bouncing or bottoming out. 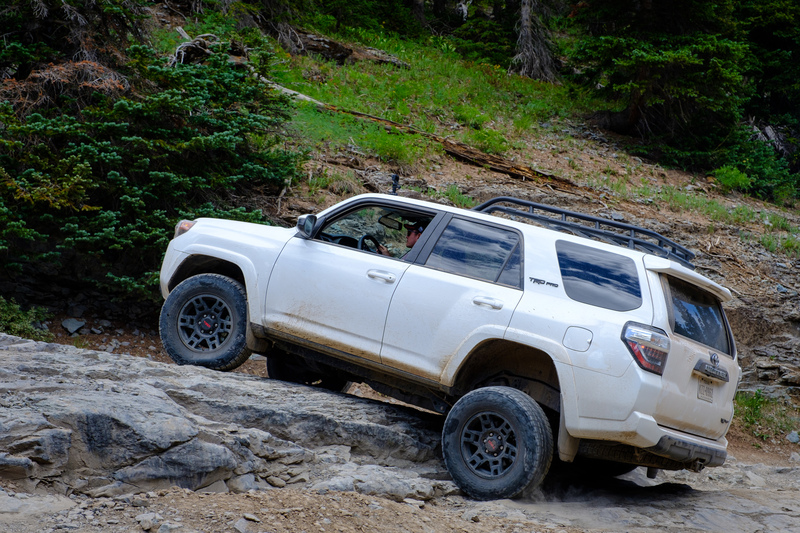 On the hellish sections of grapefruit-sized rocks, which would have shaken many trucks and their passengers to pieces, the 4Runner took on a light sway and went about its day. No harsh lurching or heads banging into windows. 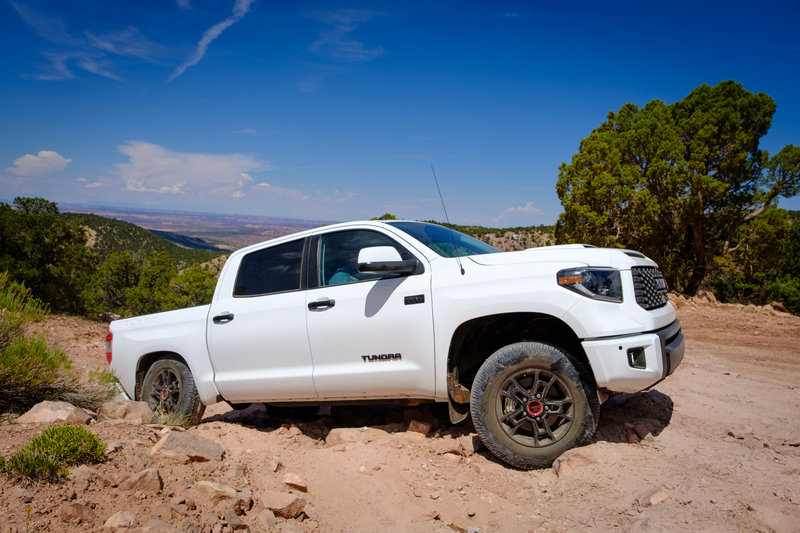 On the more technical sections, the truck’s 265/70R17 Nitto Terra Grapplers provided plenty of traction, despite the fact that one of the rear tires was mistakenly left at street pressure. 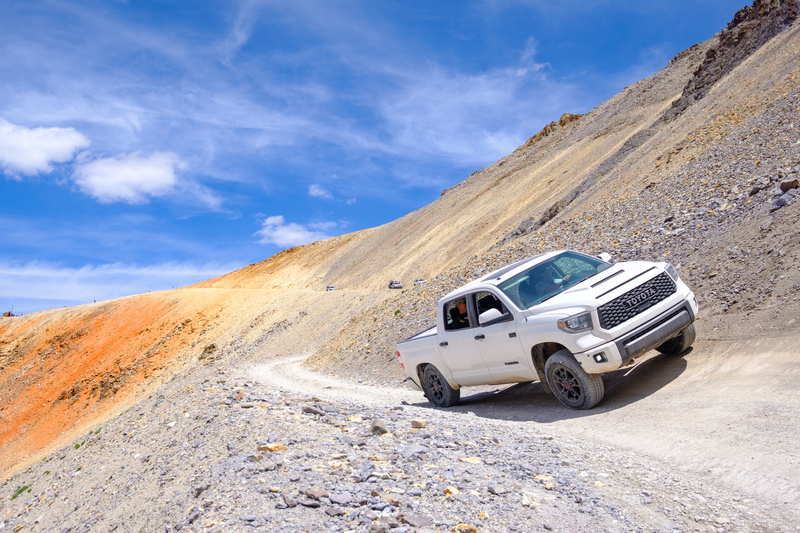 When traction finally did become a problem, and no amount of left foot braking or rear locking differential could bring us forward, I was shocked to find that the vehicle’s crawl control did the trick. 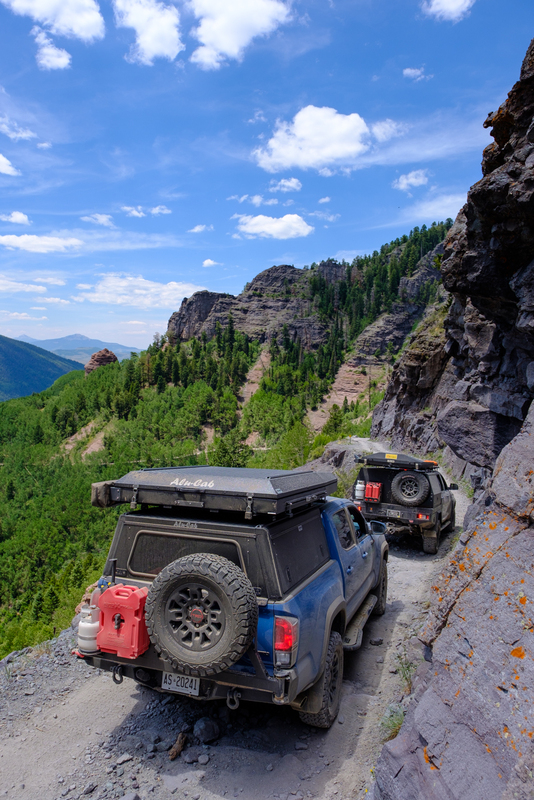 The additional 1 inch of lift in the front provided all the clearance we needed to tackle the Rim Rocker trail from Moab to Ouray, as well as the subsequent run over Imogene pass we made on the final day. 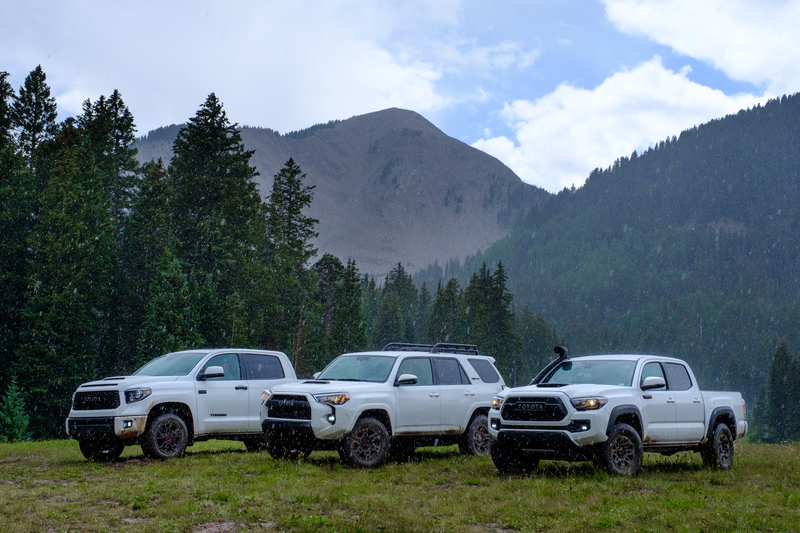 Both trails represent the sort of terrain most overlanders would encounter, and the 4Runner’s performance was impressive on each. 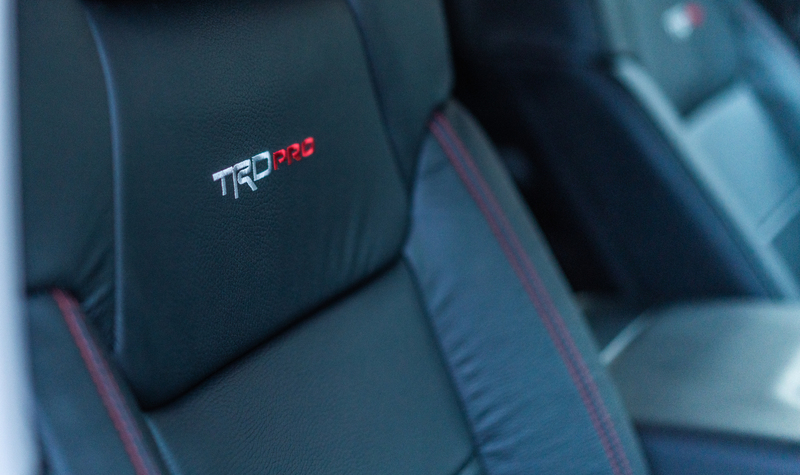 The interior felt comfortable and modern, but not overly different from any previous generation TRD Pro. 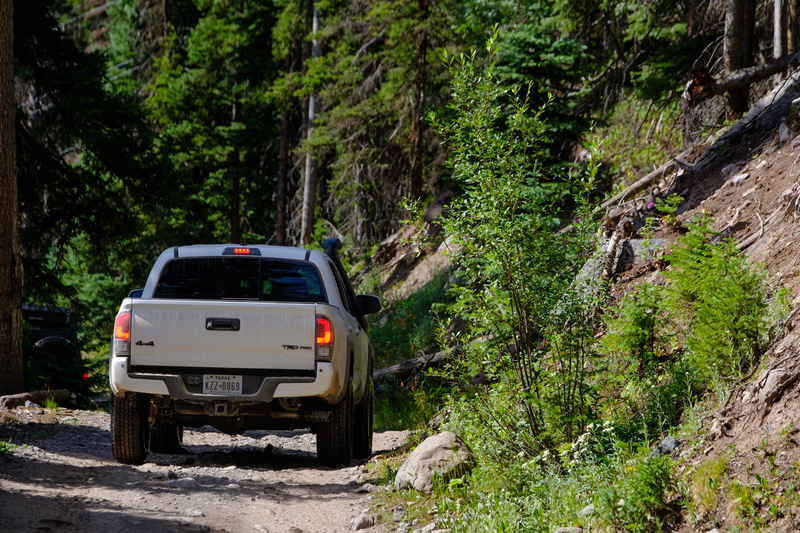 The new Entune system was easy to use and sounded great, and we gladly turned up the music while kicking up long trails of dust across the Colorado backcountry. 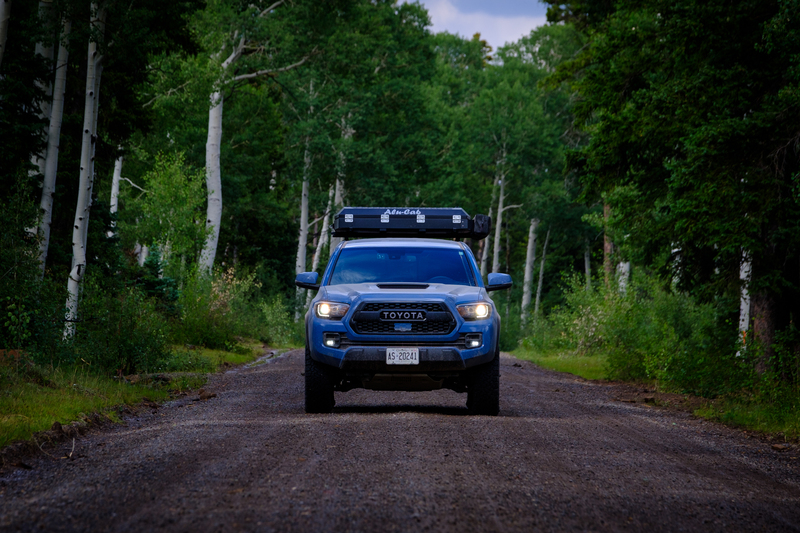 Of all three vehicles, the Tacoma has the least number of “new” accessories, but that’s primarily because it was the best equipped to start with. 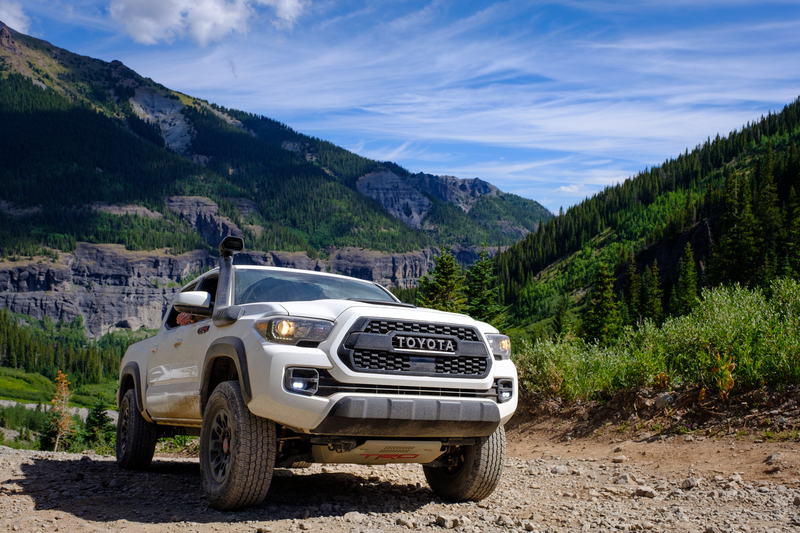 In 2019, it has a new JBL audio system as standard, an updated 1/4-inch thick front skid plate with red TRD logo, and a 1-inch-wider track width thanks to some new TRD wheels which are wrapped in 265/70R16 Goodyear Wrangler Kevlar all-terrain tires. 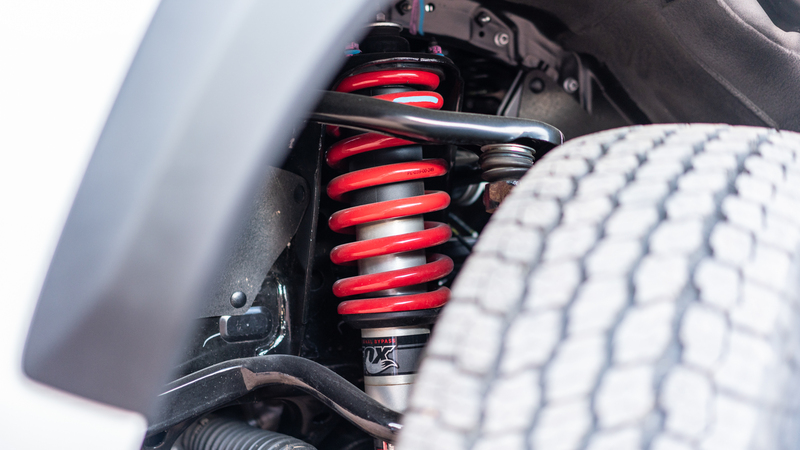 Its 2.5-inch Fox front shocks with 46-millimeter pistons and eight bypass zones are paired with factory-tuned TRD Springs for improved ride comfort and handling and provide an additional 1 inch of lift over stock. The rear is matched with 2.5-inch shocks with 11 bypass zones and 2-inch piggyback reservoirs. The most notable upgrade though is the Desert Air Intake. You read that right, Desert Air Intake, not snorkel. This raised intake is not waterproof but designed to deliver clean and dust-free air to the motor. For those of you scoffing at the lack of waterproofing, raising the intake above the dust and grit swirling through your wheel wells is the top reason most people buy snorkels. It’s why we run them on our trucks, and why most Australians and Africans do as well. 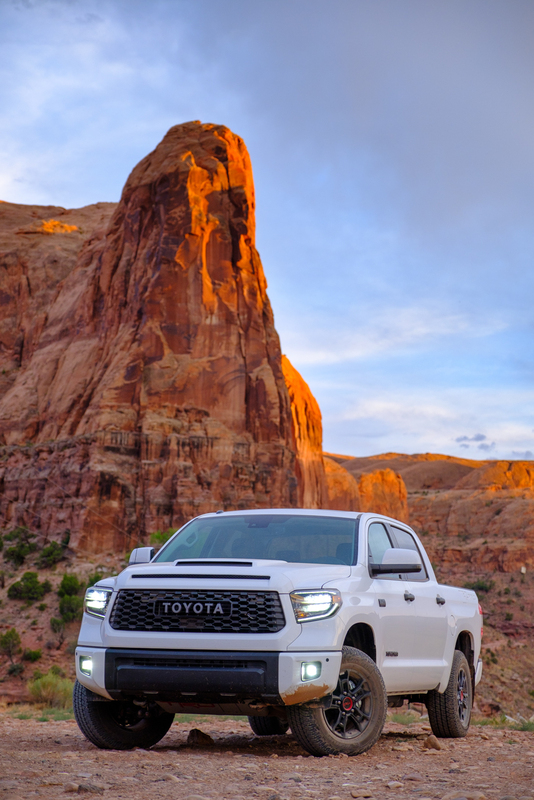 The introduction of a factory raised air intake is a massive step in the right direction for Toyota North America and further proof of the brand’s recommittal to building fun and interesting vehicles. Hopefully, with a positive enough reception, we will start to see more factory options like this in the future. I’ll be upfront with my bias; I’m not the biggest fan of the 3rd Gen Tacoma. The seating position is too low for my 6’4” stature, and the payload is 25 percent smaller than Land Rover’s Discovery Sport crossover. And despite having more horsepower than the 4Runner, the motor was underwhelming on the lifted and armored examples I had previously tested. That’s because the Atkinson cycle engine, which is based off technology used in the Prius, seems to produce power in all the wrong places for a truck. 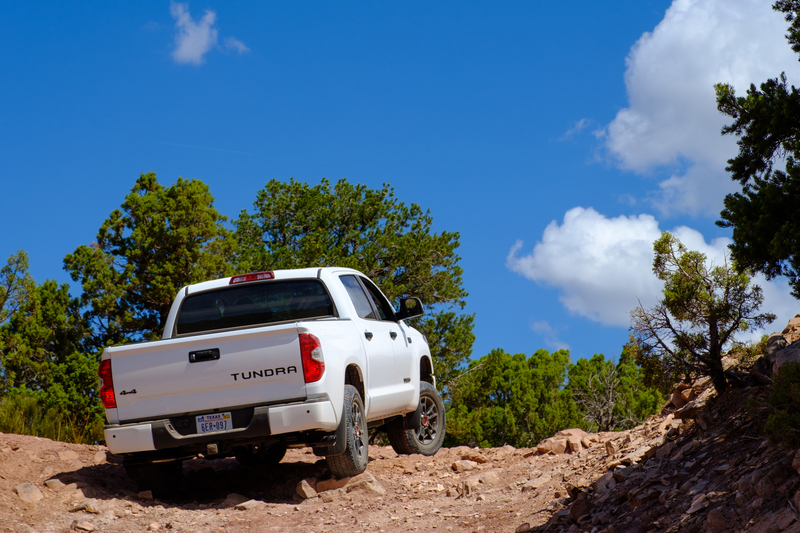 Off-road we need low range torque, but the Tacoma only produces power at high RPMs, leaving it feeling sluggish, even lethargic at low speed. What’s worse is that this incompatible power band results in worse fuel economy on the trail than we experienced with the last generation Tacoma. 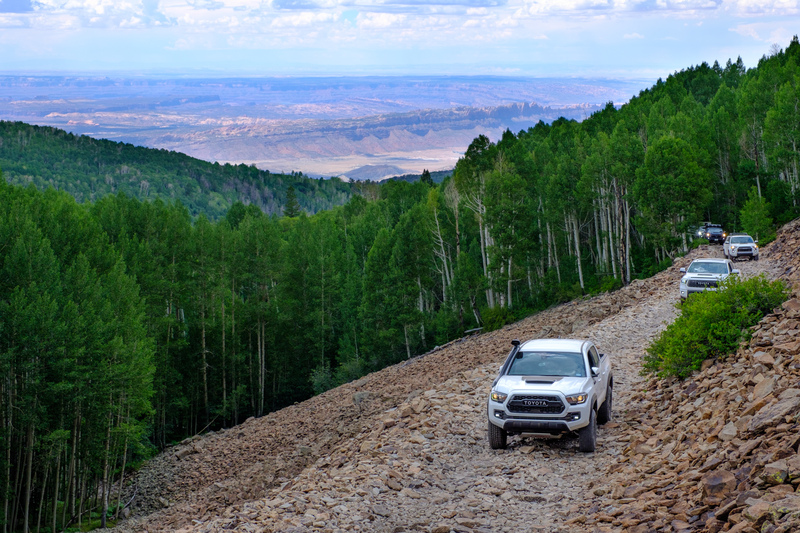 If you haven’t guessed, I came into this trip with low expectations for Toyota’s mid-size, so you can imagine my surprise when I found myself loving the new TRD Pro. Here’s the thing. 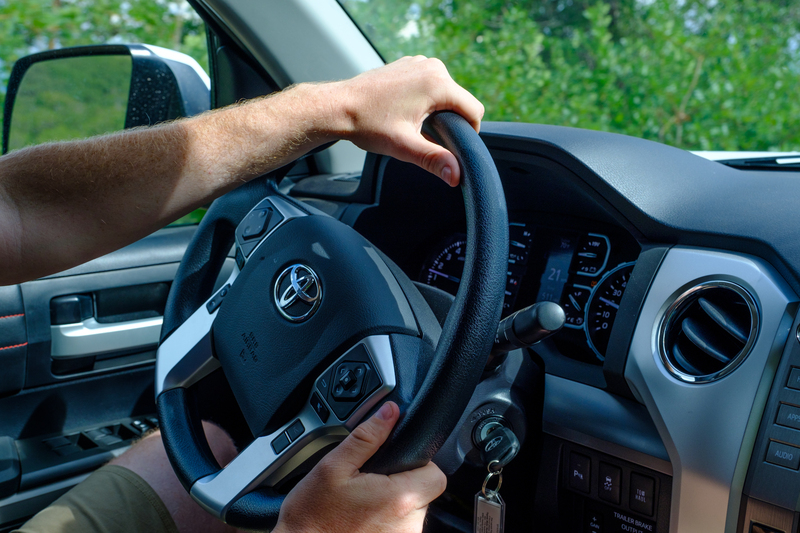 In its stock form, this Tacoma is light and agile, so the motor is able to manage the vehicle with relative ease. In fact, if you switch the 6-speed automatic transmission into manual mode, it actually gets up and moves, at least enough to plaster a smile on your face. The Fox suspension is spot on as well and feels sporty yet comfortable in the corners and smooth on corrugations. 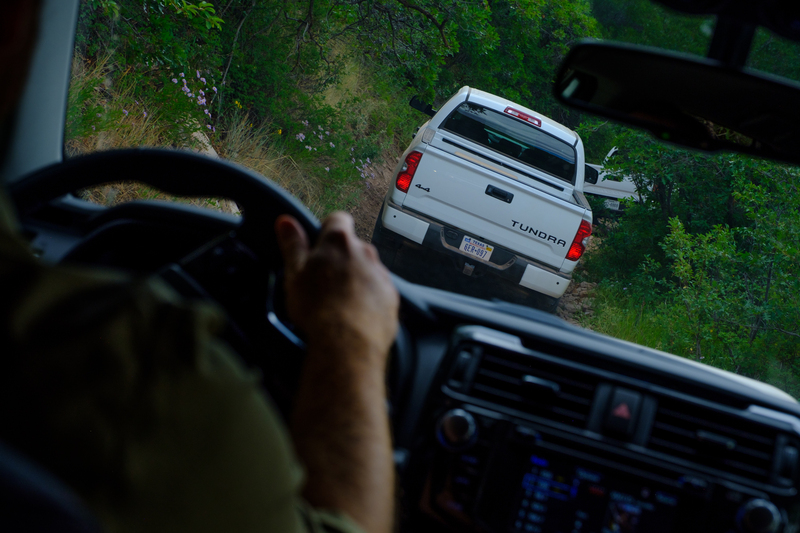 When we purposefully hit dips and bumps, expecting a harsh jarring effect, the truck simply glided over the obstacle and rebounded with a controlled return to a neutral position. It was like the truck was constantly prodding you to go faster, or begging you to sling it into the corners, which my co-driver did more than a few times. While the seating position still isn’t stellar, the truck was so fun to drive that I didn’t find myself noticing it as much. 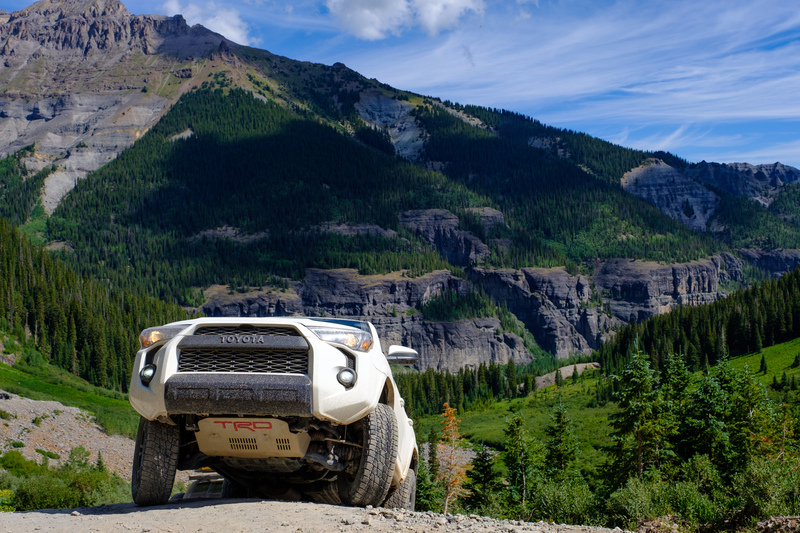 On the tighter sections of trail, the Tacoma’s prowess started to shine. Its narrower width over the Tundra made it easy to negotiate the overgrowth, and the approach and departure angle never became an issue, even when picking less than favorable lines in the rocks. The breakover was good as well, and I repeatedly found the truck clearing berms I swore we were going to scrape. What I quickly learned was that the stock TRD Pro was an entirely different animal than the modified versions I was used to. It was fun, sporty and shockingly capable on the trail. It didn’t need additional lift, larger tires, or heavy bumpers. In fact, I’d say those things are what ruined the ones I drove in the first place. The ideal Tacoma build is almost a stock TRD Pro. It stays light by skipping the bumpers and winches and retains the phenomenal factory suspension which is under warranty and engineered for the vehicle. The tires can be kept stock or be replaced with more aggressive all-terrains or mud-terrains in the factory size to make the most of the engine. 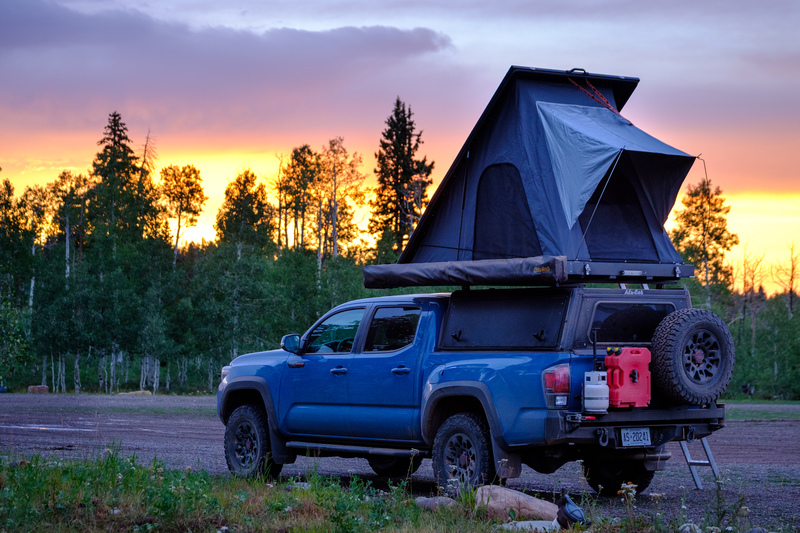 For a quick deploy sleeping setup and lockable dry storage, the vehicle would use a truck cap and hardshell tent or wedge style shell like those produced by AT Overland, Go Fast Camper, or Vagabond Outdoor. This can be used for the life of the truck, and then transferred easily to a new vehicle when you’re ready. 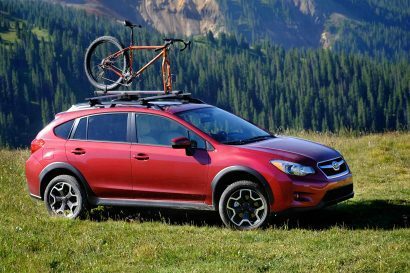 The only real modification would be a single additional leaf in the rear spring pack which would offset the weight of the accessories, gear, and supplies on extended trips. That’s it—a truck cap, tent, and add-a-leaf and you’re done. 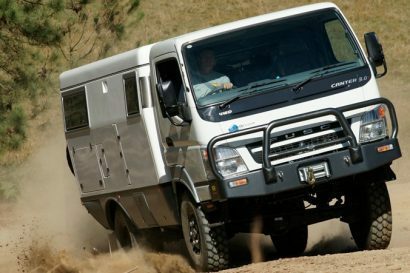 With this system, you not only have a vehicle that is capable of tackling any overland route but one that is enjoyable and efficient to drive along the way. Luckily for me, a similar truck just happened to be on this trip to prove my theory. It’s owned by an employee from Toyota of Canada, and while he did have a rear bumper, everything else was spot on. Throughout the journey, he comfortably and easily navigated every obstacle and trail we encountered. His truck rode like a dream, had plenty of power, and was still getting near factory fuel economy. As an added bonus, it looked darn good doing it. 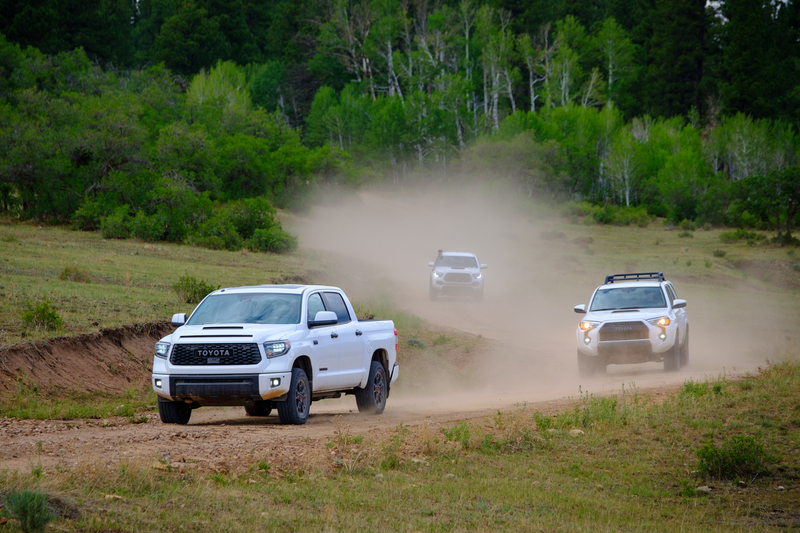 So now we return to the big question, how does Toyota’s latest generation of TRD Pros stack up to the competition? Truthfully, it’s a close call. 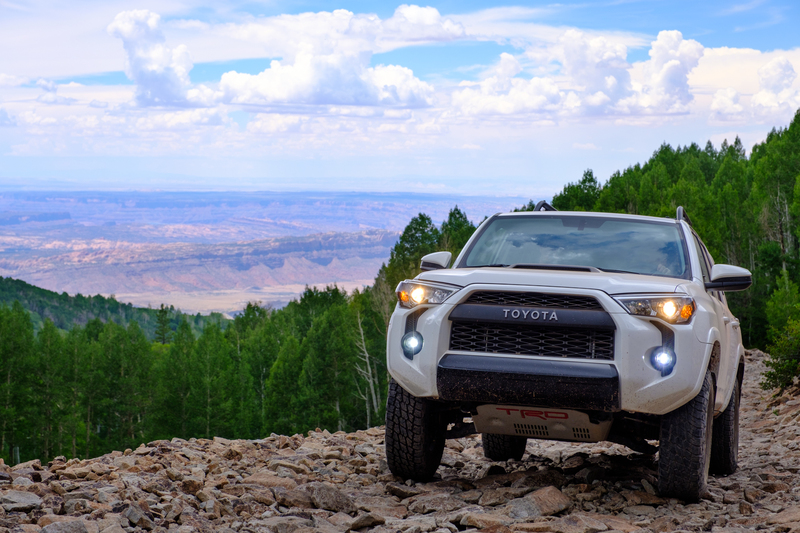 Overall, Toyota has made huge strides in producing fun and capable four-wheel drives this year. I’d be ecstatic to take any one of these three vehicles on an extended overland trip, but there are a few places where they fall short. 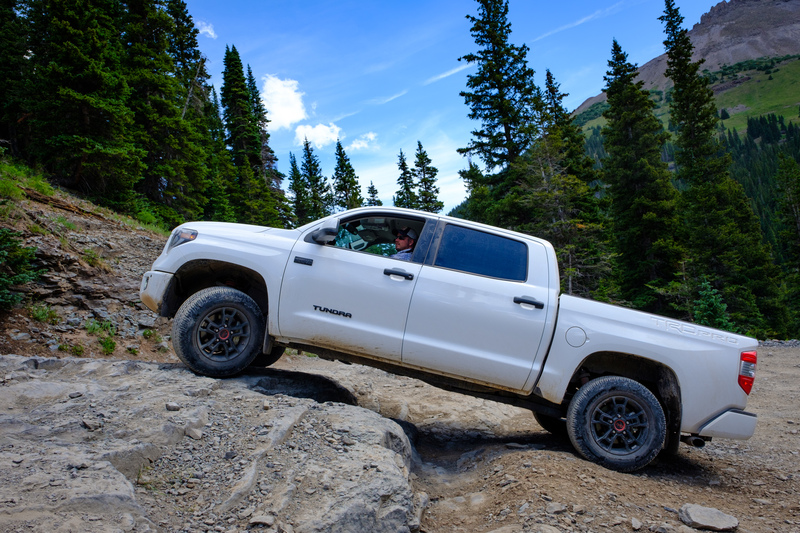 The Tundra lacks features like a rear locker and crawl control, which would place it at a serious disadvantage against platforms like the Power Wagon, a truck that admittedly comes in at a $10,000 higher price tag. 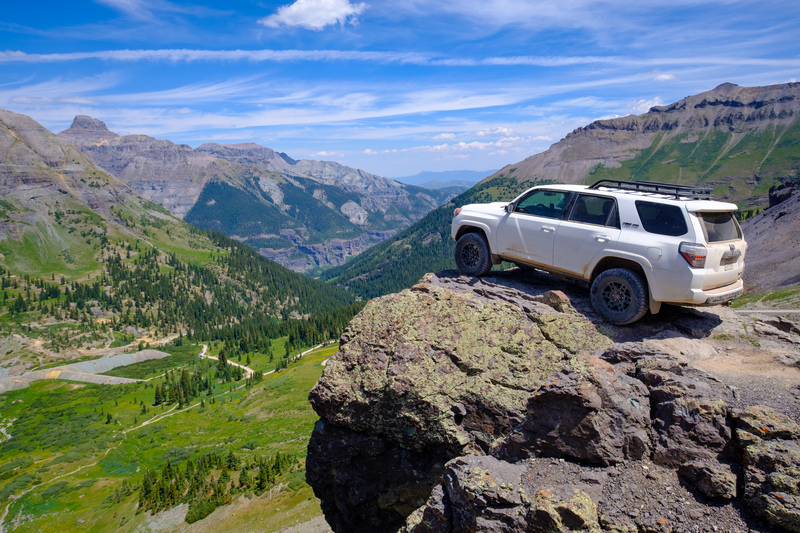 The 4Runner is still a clear winner in its segment, and we were thrilled with its performance on the new Fox suspension system, but Jeep’s JL is the most comfortable and easy to drive Rubicon yet, and it will certainly take a bite from 4Runner’s market. Then there’s the wildly popular Tacoma, which has become increasingly capable with each iteration. 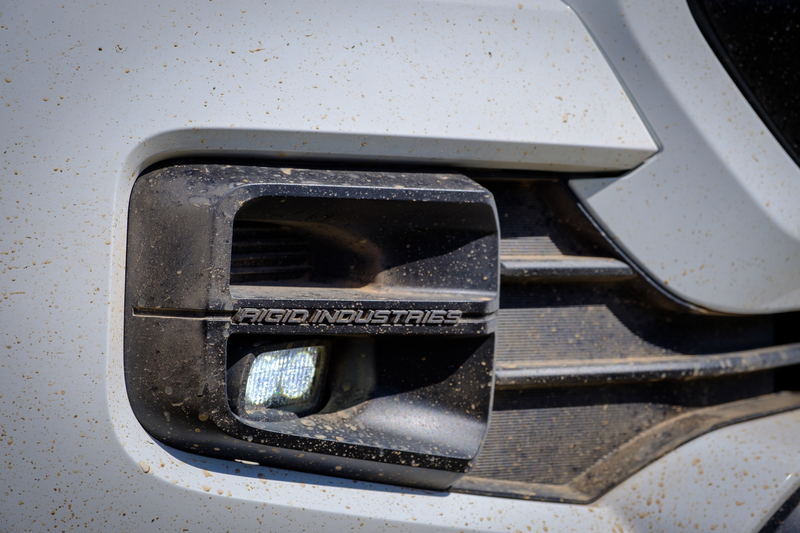 We wouldn’t go as far as to say it’s winning the competition against the ZR2 for the best mid-size truck, but with all of the accessories and off-road upgrades for 2019, it has at least shown up to the race. 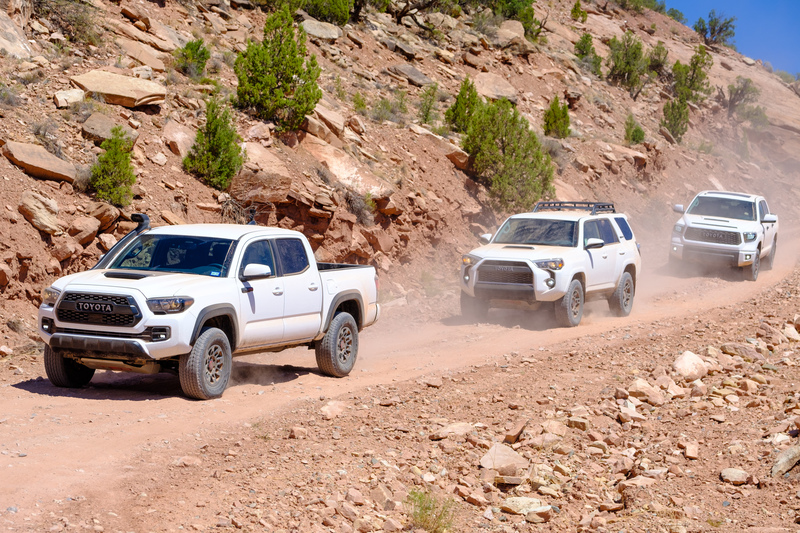 Comparisons aside, there’s no getting around that Toyota has done a fantastic job making these new trucks and SUVs. 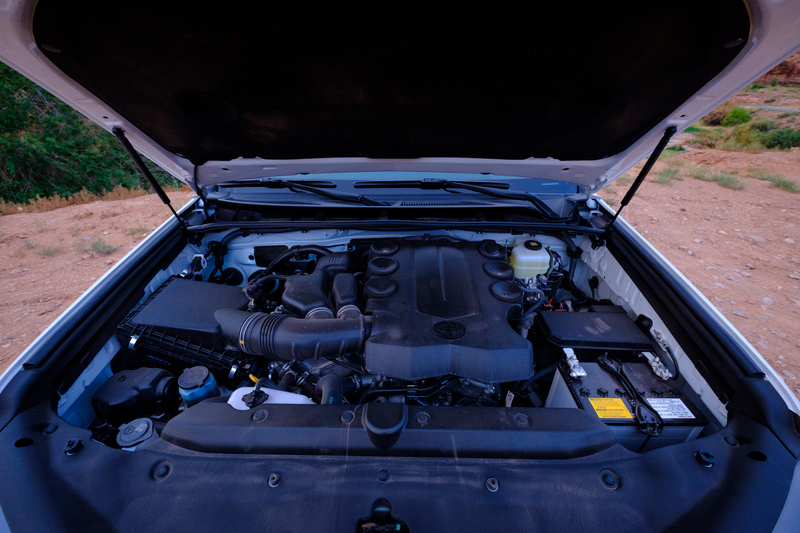 While we all enjoy modifying our four-wheel drives, the drawbacks in fuel economy, handling, simplicity, and reliability are real issues for any altered vehicle. 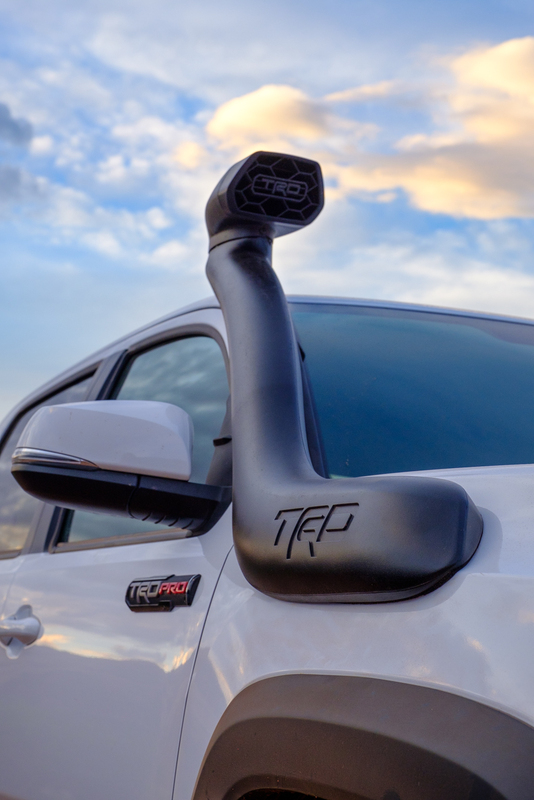 What I love about the new TRD Pros is that they help you avoid all of that complexity without sacrificing the capability. 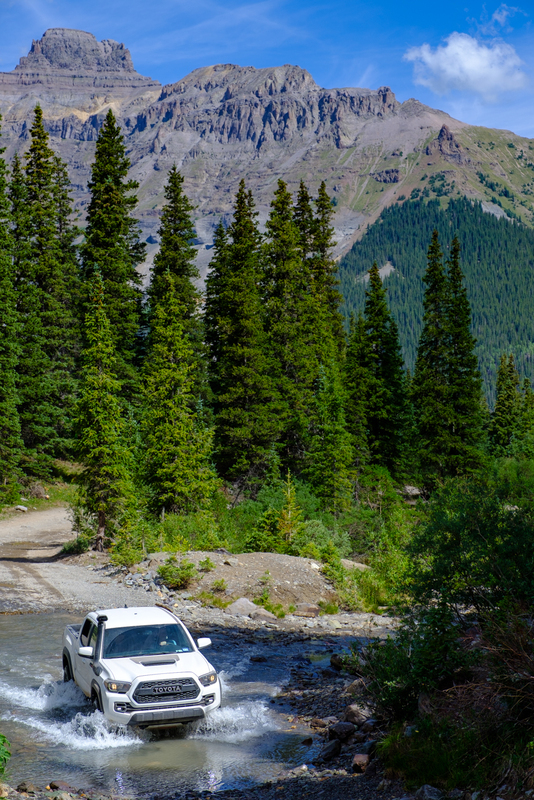 You can walk into a dealership and drive away with a truck ready to tackle just about any overland trail in North America, or even a journey around the world. 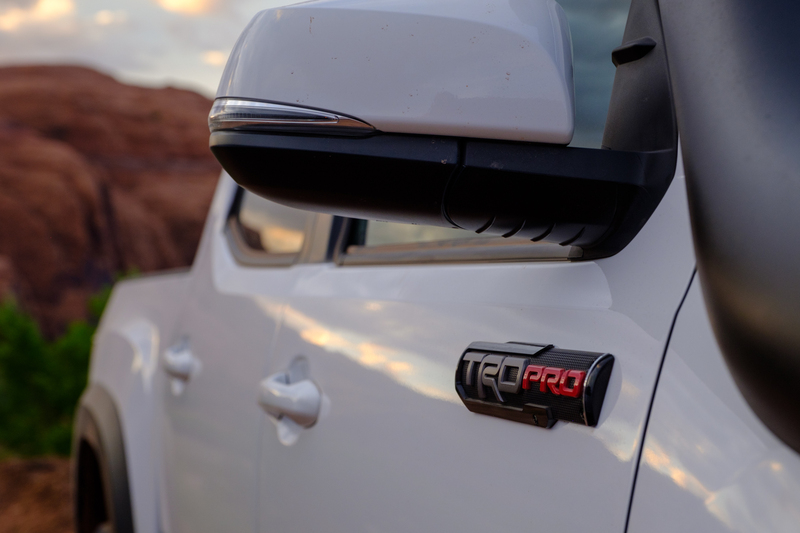 So the question becomes not if the TRD Pros are good, but if they’re the right choice for you. If you want to add a lift, swap to larger tires, and throw on a big off-road bumper, then the answer is probably not. You’ll be far better off picking up a less expensive trim package without all of the goodies and perks you’ll be ripping off anyway. 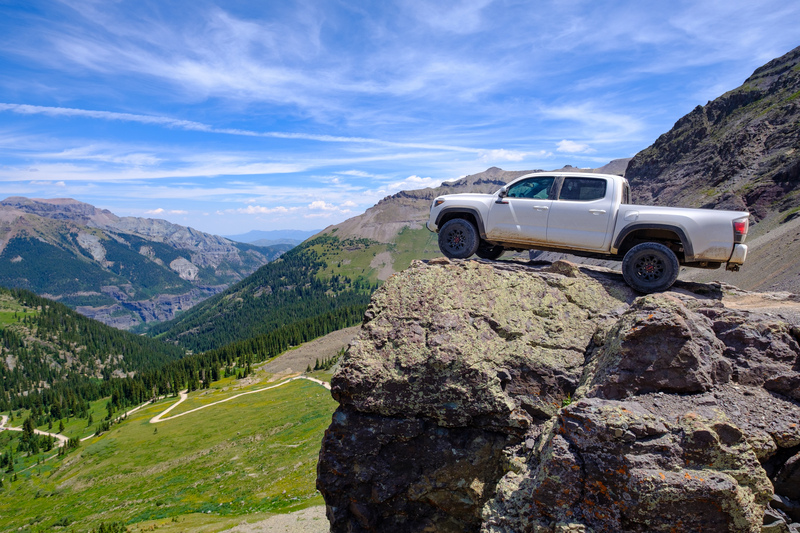 However, if you want a Toyota four-wheel drive with all of the comfort and reliability of a new vehicle, combined with the capability and flare of a modified one, then the 2019 TRD Pros might be the line for you. 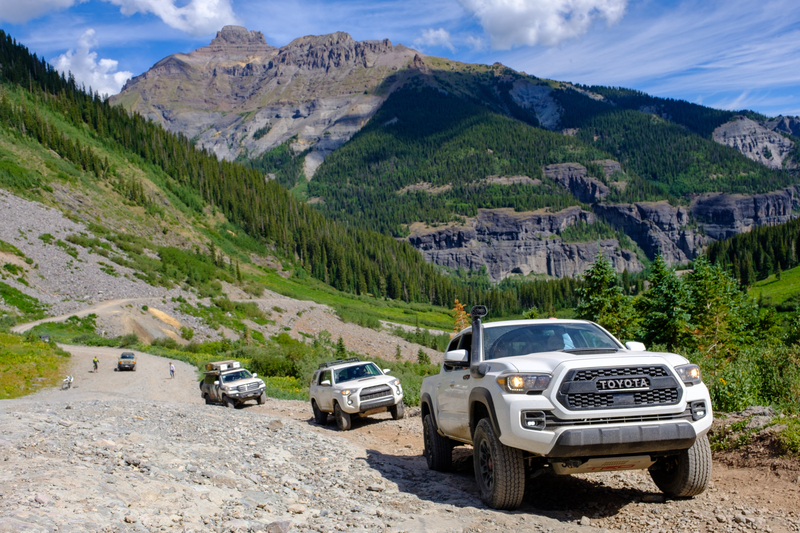 To learn more, check out their 2019 TRD Pro information page on their website here. Good article overall! I’ve been looking around to see if there are any vehicles that truly compare to the Wranglers ability and features, and the 4Runner is on my radar. 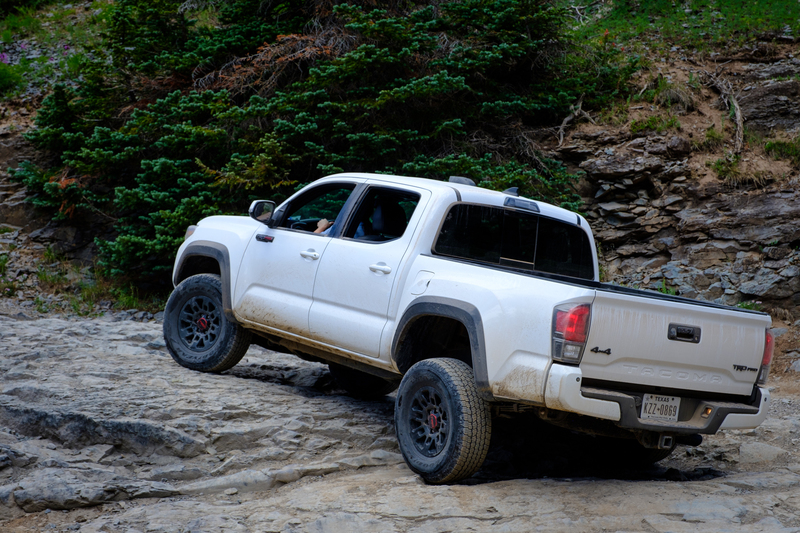 My only complaint is the comparison of the Tundra TRD Pro to the Power Wagon at the end of the article. IMO, they aren’t in the same league since the PW, which has the SRT 6.4 and 4.10’s, is also a heavy duty truck (for starters). The Tundra should be compared to the Ram Runner, although I couldn’t tell you the price difference off the top of my head. Hi Chris, thanks for the great write up and the thoughtful replies to the commments here, you and your fellow writers candor and integrity are one of the many reasons I’ve been a subscriber to OJ for several years and regularly check in here. 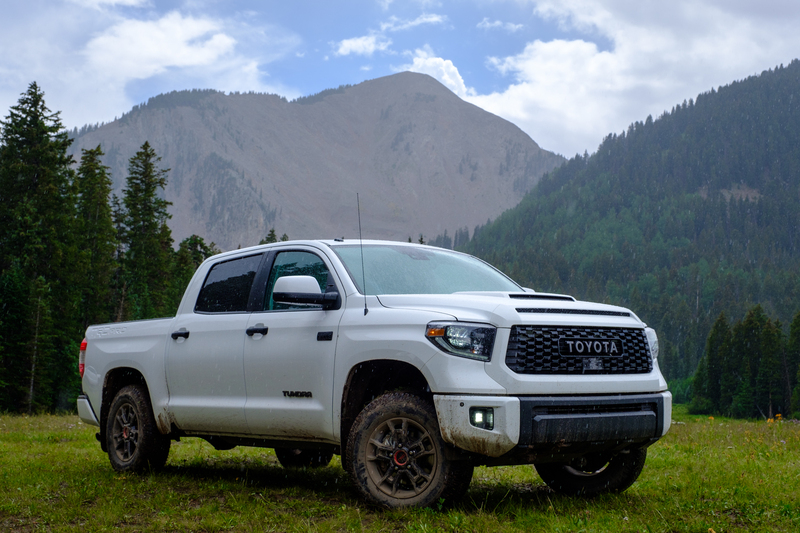 I drive a 2015 Tundra TRD Pro which we are slowly making expeditin worthy, and actually just drove over Imogene this past weekend, part of my extended backyard being that I’m from SW Colorado. I agree with everything you wrote about the pro in the article. I am however curious if you could expand on you commments about it in relation to the 1500 vs a Powerwagon. Since it’s a 1/2 ton like the 1500 I’d assume it would feel quite similar but I’ve never driven either of the new Rams. I did previously own a 2003 Dodge 2500 diesel which was obviously far less advanced than then new trucks but the Tundra certainly feels massively lighter, more nimble and has a MUCH better ride off-road, my main reason for the switch. 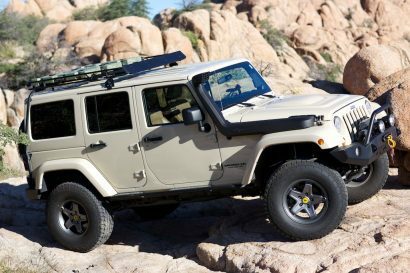 How is the Jeep Wrangler JLU Rubicon not mentioned as a competitor of the TRD Pro 4Runner? 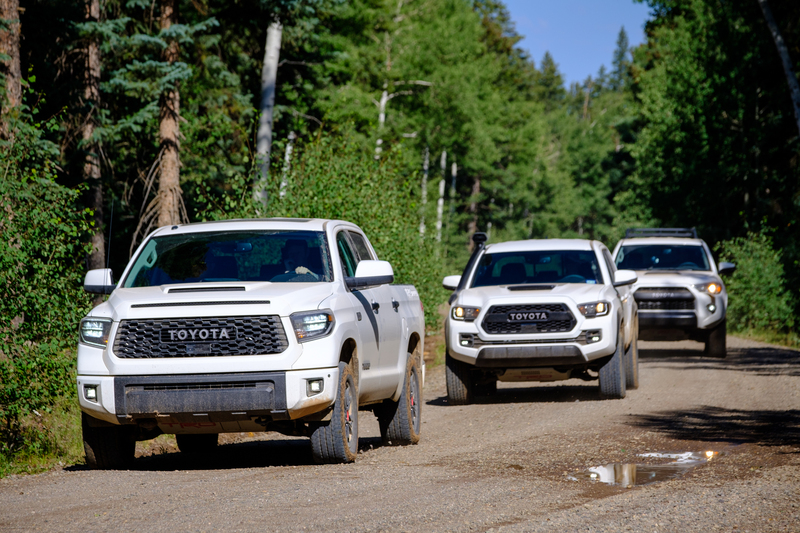 I understand that this article is more of a review of the TRD’s than a feature by feature comparison of all possible competition, but you mention in the first paragraph the primary competitors of the Tundra (Powerwagon and Raptor) and of the Tacoma (ZR2) and later make some specific comparisons between them, but claim that the 4Runner is “mostly unchallenged.” Searching for competitors you mention two vehicles in the Bronco and Defender that haven’t even been released yet and I can think of a vehicle that is not only in production, but is currently selling over 25,000 examples every month that many would say doesn’t simply challenge, but actually bests the 4Runner; especially in the Rubicon trim. Certainly, it’s a fair debate between the 4Runner TRD Pro and the Wrangler Rubicon to say which is best in a variety of categories, off-road, storage capacity, power, reliability, etc….but to claim that the 4Runner is mostly unchallenged without even mentioning the Wrangler ignores a direct competitor of the 4Runner which also happens to be one of the most iconic 4x4s….ever. 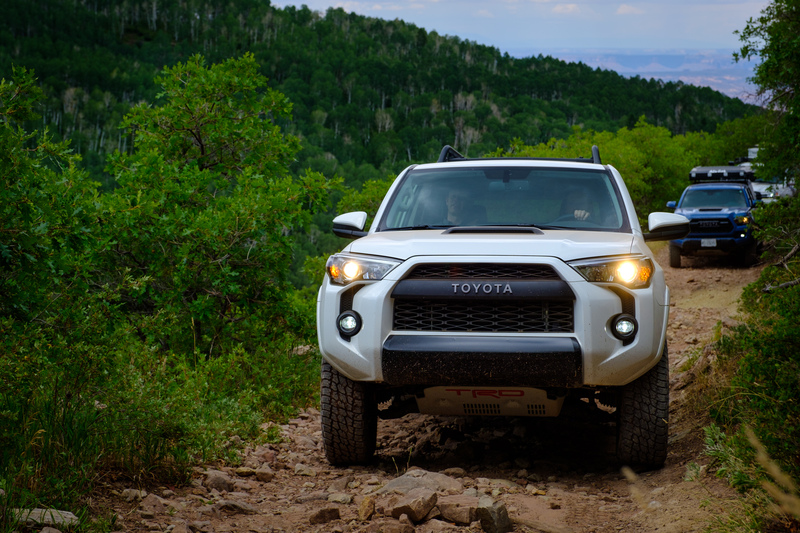 You finish under takeaways by saying that the 4Runner is the clear winner in it’s segment. I’m curious, which segment is that, that doesn’t include the Jeep Wrangler Rubicon? Gaffe, not “gaff”. You can add that to your list of gaffes. Great write-up, thanks. Great stuff, glad to see Toyota is continuing to cater to the enthusiast. But I gotta say, I’m dying to know what the next gen 4Runner will bring. Any insights at all? I wonder if they Tacoma had the new ECU update when you tested this. It was released on July 25 in canada. Why don’t they do permanent 4×4 on more of their platforms? I believe it’s available on some 4Runners and I know it’s on the newer Land Cruisers but not having it on something like the Tacoma or Hilux is a big turn off for me. I drive a Defender and really appreciate being able to have four wheel drive on the pavement (for example in bad weather) and low range without the centre diff locked (manoeuvring heavy trailers or doing ten point turns in narrow villages on a hillside). Equally on gravel roads with hairpins/switchbacks it’s nice to be able to quickly unlock the centre on the corners. It’s a feature I use every trip. I’d like to upgrade my Defender but when I make a list of all the things I value that it provides, there’s nothing better. A Hilux with a better transfer box and taller tyres would probably do it for me. This was a great write up! Awesome commentary and photos! I think this article did a great job of pointing out the TRD PRO lineup as a whole and providing additional detail about each vehicle. Thanks. I really enjoyed the read! Great article Chris! 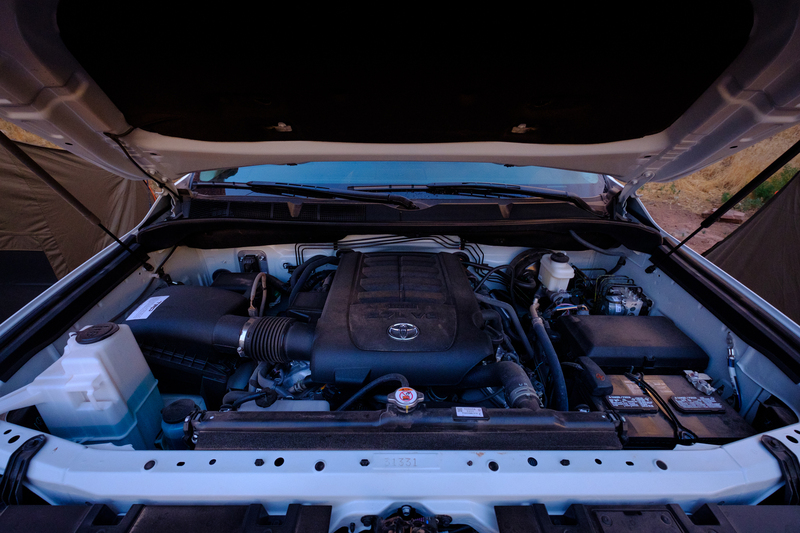 I love the styling on the Tacoma – agree with you that the engine is lacking, lucky to have the D4D diesel in my Hilux (AUS), hopefully with more diesel engine options from the competition, Toyota USA add one in the future. It is good to see Toyota is offering the 3 vehicles in the TRD line up but what about the 200 Series Land Cruiser. In the rest of the world the 200 series rates above the rest apart from possibly the 70 series. They are expensive everywhere but it doesn’t stop them being used in Australia, South Africa and across the Middle East as as a workhorse and tourer which they excel at. In comparison the Tundra is very second rate. Why in the US is such a capable vehicle relegated to the school run and not being used and marketed for what it is designed for as they are everywhere else.